The father of actor Chris Evans, who plays Captain America, is a dentist and is opposed to water fluoridation. His son suffers dental fluorosis and has expensive veneers to hide the damage. See his letter below to read about his experience with the trade organization he was affiliated with, the ADA, and how he made the change to the esteemed science/evidence based organization the International Academy of Oral Medicine and Toxicology. Dental fluorosis is increasing in Canadian kids, especially in fluoridating communities. The local dental health report claims no dental fluorosis found, without admitting that they’re screening children too young to show the signs; kids in jk and gr 2 don’t have all their permanent teeth yet – dental fluorosis shows on permanent teeth. Dental fluorosis is the visible sign of fluoride over dose. We can see the harm to teeth but not visible is the harm caused to bones, brains and other internal tissues. The cost to repair damage caused by dental fluorosis is high and not covered by dental benefits or provincially funded programs. Topical fluoride treatments and cavity repair are covered by dental benefits and provincially funded programs. The dental industry considers this harm caused by swallowing fluoride as ‘cosmetic’. Mr. Millership did not win this case; he dropped action against Kamloops because they had stopped fluoridating and he pursued action against the province and the federal government to which the judge found “neither the province nor the federal government fluoridated any water Millership consumed, so they were not liable.” It is municipalities that decide to fluoridate or not. It is municipalities that are responsible for providing clean safe water. It is municipalities that are liable for the harm contaminants they allow in the water may cause….such as dental fluorosis. How long before Ontarian/Windsor parents seek remedy for the costs of dental fluorosis repair? We’ve already heard from several parents that have paid out thousands of dollars. The Ontario Safe Drinking Water Act states nothing is permitted into drinking water that is in contravention of a prescribed standard. Safe water advocates, and anyone that takes an in-depth look, knows that fluoridation chemicals are in contravention of a prescribed standard. Standard NSF60 requires toxicology studies and those studies have never been done. This is confirmed by Health Canada, former WUC CAO John Stuart, and by the presentation made by former Medical Officer of Health, Dr. Heimann. Public Works employees continue to advise councils that the chemicals used in fluoridation do meet the standard, without providing any evidence that they do. Further, the WUC report claims that 1) Health Canada has the required tox studies (but they do not as linked to above) and 2) that we don’t need them anyway because of hydrolyzing and dissociation. Interestingly, the Ontario Safe Drinking Water Act says nothing can be added to the water that hasn’t met a prescribed standard, it doesn’t exempt things from being added because under some conditions that thing dissociates and it even goes so far as to state that dilution of the thing is no defence to adding the thing to the public’s drinking water. Dissociation and Hydrolyzing Makes Contaminants Disappear! Click to see the full presentation on Debunking Dissociation. We’ve pulled out a few images to highlight how important it is that we have safety tox studies done. Finney is the study referenced in the WUC report above that claims we don’t need safety studies because of dissociation. Why didn’t they consider the Westendorf study? Why are they relying on studies that use purified versions of fluoride and water that isn’t the same chemistry as municipal tap water? Fate Of Fluorosilicate Drinking Water Additives, Urbansky, 2002, indicates that re-association may occur. And in, A new perspective on metals and other contaminants in fluoridation chemicals, Mullenix points to further concerns about the toxicity of post dissociated compounds. The regulatory standard requires safety tox studies and dissociation is not a good enough reason to bypass this Safe Drinking Water Act requirement. The Ontario Safe Drinking Water Act exists to protect all of Ontario’s municipal water drinkers from contaminants. Putting an untested, unregulated contaminant, silicofluorides, with trace co-contaminants of arsenic, lead and mercury, into the drinking water supply is not permitted, nor should it be. With Windsor’s new council voting to reinstate fluoridation chemicals into the water supply we’ve received inquiries from other Essex County water drinkers. Historically: Leamington, Kingsville and Essex have never been fluoridated. Amherstburg ended fluoridation before Windsor did. Lakeshore had only one of its water plants fluoridated and ended that nearly a decade ago. LaSalle and Tecumseh are currently customers of Windsor’s water supplier, Windsor Utilities Commission. It isn’t clear what the Health Unit’s fluoridation promoting plans are and if they’ll target other municipalities within the region next (though they are going to Tecumseh on January 29th, write them at info@tecumseh.ca to ask them to keep fluoride out!). 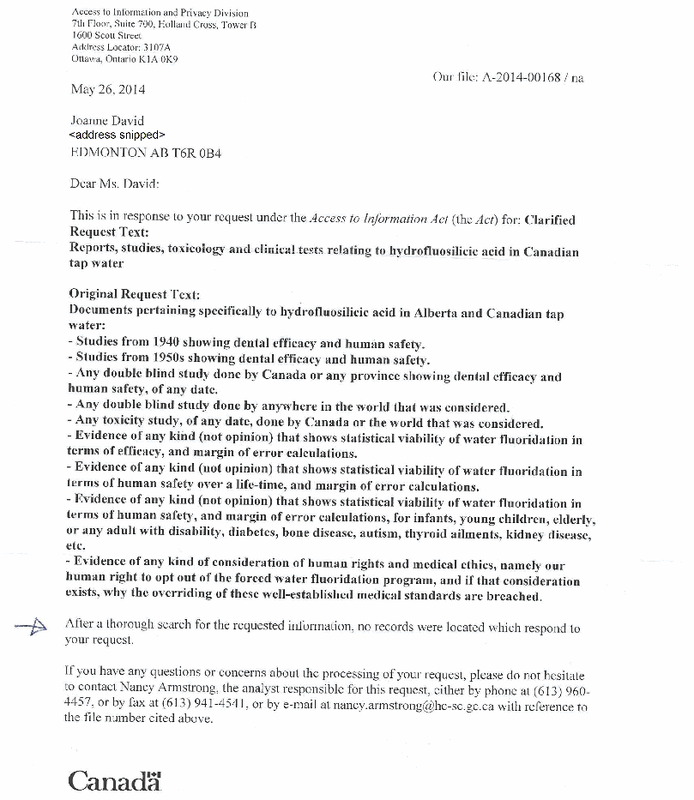 The following letter (along with contact information that has been removed here) was submitted to the councils of Tecumseh and LaSalle by Canada’s leading authority on fluoride. Five years ago, Dr. Hardy Limeback provided expert advice to the former City of Windsor Council (that voted to end fluoridation). Windsor’s current council did not seek any input from fluoride experts. Tecumseh and LaSalle Councils still have to make a decision. And it isn’t too late for Windsor Council to reverse their decision and take precaution. I am concerned you might make the same mistake that the Windsor council did and approve the addition of fluoride into your drinking water. In my opinion, the new Windsor council made a huge mistake and I will try to explain why. My background as a fluoride expert: I have a PhD in Biochemistry (1979) and a dental degree (1983) from University of Toronto. As a professor-dental scientist, I received many national grants to do laboratory and clinical research, mostly on the effects of fluoride on teeth and bones. At the same time, I maintained my own part-time dental office. It was in both my dental practice and supervising the thousands of patients in the Faculty of Dentistry clinics in my program that I noticed that almost every second child had some form of dental fluorosis (see below). I was one of 12 scientists in North America chosen to serve on the U.S. National Academy of Science’s committee that produced the 2006 report Fluoride in Drinking Water. Taking three years to complete, we reviewed over 1,000 studies. That report is still considered the most authoritative, comprehensive work ever done on the toxicity of fluoride. As I intensively studied the literature and performed my own research, the evidence clearly demonstrated that fluoridation is more harmful than beneficial. In 1999, I publicly changed my position. In doing so, I joined the vast majority of nations, cities and medical organizations throughout the world that do not endorse fluoridation. Indeed, 95% of the world’s population drinks unfluoridated water. Our NAS committee concluded unanimously that fluoride could harm the functions of several human organs in addition to developing teeth. These include the brain, the skeletal system (from which our immunity is derived), the thyroid and the kidney. We also determined that much more research needed to be done, especially regarding fluoride’s effects on the brain, kidney disease, diabetes, hypothyroidism and cancer. Nearly 13 years later, much research has been done, including major neurotoxicity studies led by Canadian and American scientists. A 2017 petition to the U.S. EPA to end fluoridation documented that fluoride caused brain and/or central nervous system damage (mainly lowered IQ in children) in 57 out of 61 human studies, several at levels in fluoridated water, and 112 out of 115 animal studies. Moreover, our NAS review concluded unequivocally that fluoride lowers thyroid function. Hypothyroidism (low thyroid levels) in pregnant women is known to be linked to lower IQ’s in their children. As I mentioned, I have been alarmed at the skyrocketing rates of dental fluorosis, an irreversible disease caused by an excess of fluoride ingestion in small children. It causes a staining of the teeth with white splotches at mild levels and structural damage with yellow and brown stains at the moderate and severe levels. In the U.S., which fluoridates far more than Canada, the latest study (Neurath, Limeback et al, JDR Clin Trans Res, 2019 in press) found it has reached epidemic proportions – it now afflicts 72% of all 12-15-year-olds, with 27.9% moderate and 2.8% severe. All sources of ingested fluoride contribute to this toxic load, but water is by far the largest contributor. Higher fluorosis levels in children have also been linked to lower IQ’s. In this ongoing debate, this is what is perhaps the most disturbing to me: both before and after our 2006 report, fluoridation advocates have declared, with certainty, that fluoridation is safe for everyone. This assertion was, and is, contradicted by the science and is totally unjustified. Why do so many dentists and others in Canada and the U.S. support this practice? Most people follow the pronouncements of authority figures like Health Canada, the U.S. CDC and dental associations. I can’t speak for any individual, but I believe most people, inside and outside the government, haven’t reviewed the literature, especially on health risks. If they had, I think most would change their minds. There’s another factor, especially for professionals, which should be noted. If you speak out against fluoridation, you risk being criticized by these authorities and shunned by your peers. I know many dentists and physicians who oppose it but fear taking a public stance based upon these legitimate concerns. Please consider leaded gas, leaded paint, asbestos, DDT, DES, tobacco and many other substances. They were all accepted as safe by the medical establishment until the research on their harm became so compelling that authorities had no choice but to ban or restrict their use. It often took 50 years or more for government action to catch up to the scientific warnings. Fluoridation is following exactly the same path. The evidence opposing this practice is already extensive. It was clear to me in 1999 that scientists had already compiled enough data to call for its cessation. In the two decades since, hundreds of studies have further validated my earlier conclusions. For the health and safety of your residents, I strongly urge you to oppose fluoridation. Thank you for your consideration, and please feel free to contact me if you have any questions. Tecumseh Town Council will hold a public meeting on Tuesday, January 29, 2019 at 6 p.m. to hear from the Windsor-Essex County Health Unit in relation to their “Oral Health Report 2018”. There will be no vote at this meeting with respect to fluoridation in the water. A vote by Council will be held at a later date once full details from the City of Windsor and Windsor Utilities Commission regarding this matter are available. The Town has received a number of comments regarding fluoride in the water and these have all been shared with Council. Due to the volume of comments already received, we recommend that anyone wishing to share their views on this matter do so via a letter to Council that can be delivered to Town Hall or emailed to info@tecumseh.ca This will ensure that all opinions on the matter are shared with Council in absence of being approved as a delegation or if you are unable to attend. Anyone wishing to appear as a delegation at this meeting must register with the Clerk’s office at 519-735-2184 ext. 139 or jalexander@tecumseh.ca prior to Tuesday, January 22, 2019. Delegations must provide written notice on the topic to be discussed and their request of Council. Delegations have a maximum of 10 minutes and groups must designate a spokesperson as only two speakers will be permitted. The Clerk reserves the right to limit the number of delegations and will advise those chosen to speak in advance of the meeting. Tecumseh needs to know safe water advocates are not the minority. PLEASE delegate and if you can’t please submit an email/letter. Keep your letter short and include your name and address. Even a simple “I am not fluoride deficient and you do not have my consent” can be effective. When the water provider (Windsor Utilities Commission) for Windsor, Tecumseh and Lasalle, recommended that the City of Windsor cease water fluoridation, the council of the day voted a 5 year moratorium on adding hydrofluorosilicic acid into the drinking water supply. That five years has come and gone. 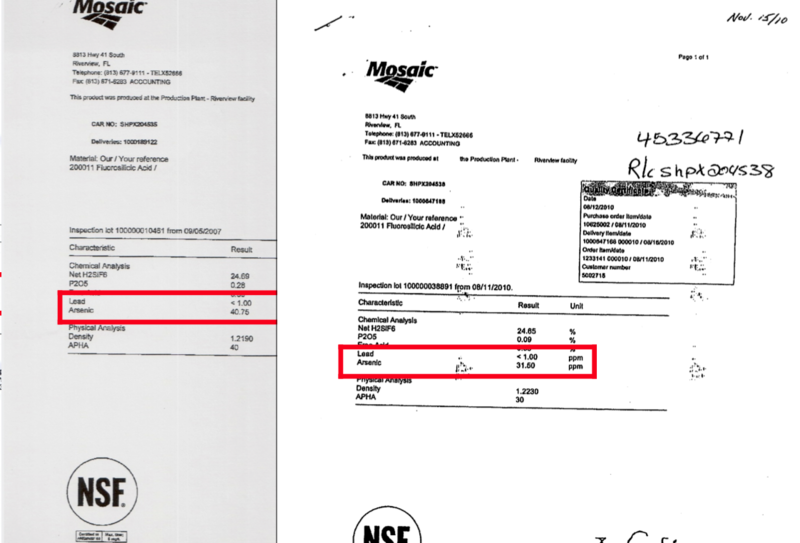 – It doesn’t provide data by municipality; Lakeshore voted unanimously to stop adding fluoridation chemicals to their Stoney Point water treatment plant in November 2011, their other water treatment plant, in Belle River, never had it added. Amherstburg voted unanimously to end fluoridation in February 2012, but hadn’t fluoridated since the April prior due to equipment failure. Kingsville, Leamington and Essex never fluoridated their water supply. Windsor, Lasalle and Tecumseh ended fluoridation in early 2013. A previous oral health report from 2016 did provide data by municipality and reported that Tecumseh and Lasalle had the fewest cavities, Leamington and Windsor had the most, the remaining communities were fairly equal and the difference from the lowest to highest cavity rates was less than half a cavity. That’s right! LESS THAN HALF A CAVITY. – The report doesn’t control for confounding factors, data wasn’t collected scientifically, isn’t peer-reviewed or published; the Health Unit would like policy makers to believe that their data proves the effectiveness of fluoridation, but they haven’t even considered such factors as: access to fluoride from other sources, income, diet, dental visits, oral health practices, how much tap water (with or without fluoride) is being consumed, and other factors. – Water fluoridation does nothing to remove barriers to access to dental health care by a professional. – No one is monitoring total fluoride exposure from all sources. Fluoride is in toothpaste, other dental products, and in some food and beverages. The science is clear that too much fluoride is harmful, especially for the most vulnerable – infants, those with compromised immune systems, pregnant women, those with thyroid and kidney conditions. – The report claims there is no dental fluorosis in the teeth of children screened, but children screened have none or very few permanent teeth. Permanent teeth would show the signs of over exposure to fluoride. The Canadian Health Measures Survey showed that 40% of adolescent aged children have some form of dental fluorosis. – Screening is done by dental hygienists (who are not allowed to diagnose caries/cavities) under really bad lighting conditions in schools. 1. A Canadian study, published in October 2018, found that adults who are iodine deficient and have higher levels of fluoride in their system have a greater risk of an underactive thyroid. Christine Till, an associate professor and researcher at York University, told EHN one of her main concerns is that pregnant women are susceptible to iodine deficiency, which, according to the study from Canada, could leave the mothers-to-be with thyroid problems. Also, fluoride easily crosses the placenta from mother to her unborn. The study is not the first to find a fluoride-behavioral link: A previous study linked the element to ADHD in U.S. children. 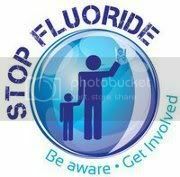 Fluoride as a neuro-toxin has been studied before with respect to fluoride exposure in children outside the womb. Fluoride proponents disregarded these earlier studies claiming they aren’t relevant because they weren’t conducted with fluoride exposure at levels seen in North America. Will they continue to ignore the mounting evidence and these newly published North American studies? Remember, water fluoridation schemes began before fluoridated toothpaste was readily available. Today, we can buy toothpaste with fluoride cheaply in nearly every store. Public Health needs to stop relying on the outdated and false claims about the efficacy and safety of water fluoridation and start dealing with the lack of access to dental health care for a growing number of Canadians. Drinking water should be safe for everyone, including pregnant women and their unborn children, the iodine deficient, those with kidney and thyroid conditions, and our most vulnerable. Windsor Council made a progressive and protective decision, five years ago, when they decided to end water fluoridation. Council will vote on this issue again and they need to hear from you before December 14, 2018. Please send a brief message letting them know you want your water free of fluoridation chemicals. Council contact emails can be found here.